Michael was not prepared for the rigors of such an adventure and suffered many hardships and mental and emotional stress, including a dangerous crew member with a personality disorder. Michael talks about the biggest surprise that came from this attempt, the psychological impact. On the ocean, he noted, you lose all of your control, which required him to adapt to the environmental conditions and get a grip on his attitude. As Michael says, “You can’t change the direction of the wind, but you can adjust your sails.” Another lesson he learned was to recognize the difference between a temporary inconvenience and a real problem. Listen at: www.HolisticSurvival.com for more about Michael’s rough voyage that ultimately led to some of the best lessons about life. Michael Cosgrove earned his BS from Michigan State University and his Masters in psychology from Western Michigan University. He has been a teacher, a coach, a psychologist (MA), a model and an actor. For the past 32 years, he has been masquerading as an insurance agent. The writing process for his book was an emotional experience for him because he has always battled debilitating Dyslexia. First, he hears the words in his head, then feels them in his heart, and they come out of his fingertips onto the keys of his computer. His hope is that his message in Imperfect Passage will add value to the lives of his readers. He realized it’s not about him, or the book, but what he can offer the audience as a result of his experience. He hopes the readers will find meaning in the power of success, as well as the lessons of defeat. Jason Hartman: It’s my pleasure to welcome Michael Cosgrove to the show. He is the author of Imperfect Passage. And we’re going to hear some amazing things about his long, long journey on a sailboat all the way from Southern California to Auckland, New Zealand, way down under there. And there are some good life lessons that we’ll hear and I’m anxious to hear them directly from them. Michael welcome. How are you? Michael Cosgrove: Thank you Jason. I’m wonderful and thanks for having me on. I love you show. Jason Hartman: Well thank you. It’s funny what a small world it is Michael, because you have a home in Irvine, California where I lived for many years. And then right now you’re coming to us from a beautiful lake side home in Northern Michigan, right? Michael Cosgrove: That’s our summer getaway, yes. We call it Camp Cosgrove and we entertain our eleven grandchildren here during the summer. So it’s a wonderful change from Orange County. Jason Hartman: Good stuff. Well hey, what inspired you to jump in a sailboat and leave San Diego, and attempt to sail around the world? What the heck? Michael Cosgrove: Well it all started on my 60th birthday. I cruised past 40 and 50 without even looking back. Then at 60, we were living in Laguna Beach at the time looking out over Bluebird canyon; beautiful view of the Pacific Ocean from Dana Point to [0:02:32.7]. When it came time to open presents I pulled my youngest grandson Alexander up on my lap, and the first present he opened was a dozen golf balls. And I said without thinking, Alexander, when you’re 20 we’re going to play a lot of golf together. And Jason, it was as if a lightning bolt hit me, and that lightning bolt said that when Alexander’s 20, you’re going to be 82 years old. Now what do you want to do with the rest of your life? You have 15-20 years of good life left; what do you want to do with it? Well I thought about finishing my PhD, buying another Harley, learning a foreign language, but nothing worked. I needed to leave a legacy for my grandchildren. And I had been sailing for about 30 years, up and down the coast pretty much. And I decided a dream of 30 years ago of sailing around the world was feasible now after raising four children, paying for four college educations and four weddings. Now it was my turn. So I bought a bigger boat and headed out of San Diego to fulfill the dream of sailing around the world. Never having sailed out of sight of land before. So that’s what motivated me to go. Jason Hartman: How big was the boat? Michael Cosgrove: The boat was 40 feet long and it was a good ocean-going boat. Jason Hartman: Yeah? What kind of boat was it? 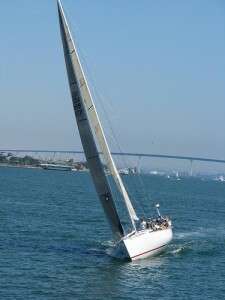 Michael Cosgrove: It was a Bayfield 40 designed by Ted Gozzard. It was well equipped to go across the oceans; I wasn’t. Having never been out there before, I didn’t really know what I was getting into. Jason Hartman: So how long did you sail before this? Michael Cosgrove: I had sailed about 30 years up and down the coast and the inland lakes. But I had never gone out of sight of land. So that was the difference really. Jason Hartman: So this was a pretty big attempt at age 60 to do this kind of thing. What were some of the things that happened to you on the trip and what did you learn from some of those experiences? Michael Cosgrove: Well I took on a crew member. I wanted to go alone, but I took on a crew member in the beginning. I didn’t know the guy; I found him in the newspaper. And he turned out to have a personality disorder and about half way to Hawaii he said, “Michael you don’t deserve this boat. It should be mine.” And he threatened to hit me over the head with a wrench and take my boat. Jason Hartman: Out in the middle of the ocean he did this, huh? Michael Cosgrove: Out in the middle of the ocean, yup. So I was able to talk him out of it. It was like a 2,000 mile therapy session. But I have a master’s degree in psychology and that really helped. I had saved a lot of people, or helped save a lot of people from suicide. Now it’s my turn to save myself from this crazy guy. But one of the biggest surprises to me was the psychological impact that being in the middle of the ocean has on one’s total being. I’m sure we’re in control of our environment. We turn up the heat if we’re cold; we change the channel if we don’t like the program. On the ocean, you lose all your control. The weather and the conditions determine where you go, how fast you go, when you eat, when you sleep. So that had a tremendous effect on my psyche. Just trying to adapt to losing all of my power, all of my control. So that was the first challenge I guess, was trying to get a grip on the environment, on the condition. Jason Hartman: And so getting a grip on the condition and the environment, you have this basic mutiny with this guy that was threatening to kill you out in the middle of the ocean where you had no recourse; no one could help you. Pretty amazing. What else happened? Michael Cosgrove: Well, talking about survival; being on the ocean and out of control or having no control, the first thing you have to get a grip on is your attitude, your psychological state. Because if you don’t take care of yourself, you’re going to have a lot of trouble trying to work under very difficult conditions like sleep deprivation, you can’t eat when you want to eat, foul weather, storms. You need to realize, you can’t change the direction of the wind, but you can adjust your sails. Jason Hartman: And that is a great quote. “Tis the set of the sails, not the gales that determines the direction of the ship.” I believe is how that one goes. Michael Cosgrove: Ah, that’s very good. Jason Hartman: Was it Thomas Carlyle that said that maybe? I can’t remember. Michael Cosgrove: I don’t know. I don’t know for sure, but it speaks to the fact that you have to have your attitude in control. And then another one is you need to know the difference between a temporary inconvenience and a real problem. Sometimes a squall, a storm, is nothing more than a temporary inconvenience. When I was between New Caledonia and Australia, I lost my auto pilots. I had to hand steer the boat for about 800 miles. Jason Hartman: And how long does it take to go 800 miles hand steering? Michael Cosgrove: Well my average speed was 4.2 knots, so about 100 miles a day was a good day. You could walk faster than what I steer. Jason Hartman: I mean, how could you possibly steer the boat yourself for 8 days? You had to sleep somewhere in there. Michael Cosgrove: Between storms I would sleep 15 minutes at a time with the helm kind of tied down, I’d lash it down and sleep 15 minutes at a time. But learning the difference between a temporary inconvenience and a real problem helps. And it’s also darn near impossible to do well what you don’t do often. I had never sailed out on the open ocean. And I don’t care if it’s solving complex math problems, or hitting a golf ball, or making love to your wife, if you don’t do it often, you’re probably not going to do it well. So that was one of my big mistakes. I didn’t know what I was doing in the middle of the ocean. During cyclone season I would fly back to Orange County. And after making the first passage to Hawaii I was done with the boat. I wanted to walk away from it. I wanted to have a delivery boat take it back to San Diego and sell it. But once I got home and recovered, and the bed stopped moving from the motion of the ocean, I realized that I had an opportunity of a lifetime and that I had to go back to sea. Even though I missed my wife, I missed my grandkids and it was very difficult conditions. But when I die and they spread my ashes, I don’t want there to be any regrets in the box. I didn’t want to be 82 years old sitting in my leather recliner watching football games thinking could have been, would have been, should have been. Oh I should have sailed on to Bora Bora. Why didn’t I go? So I went back to sea and sailed on. Jason Hartman: So when you say you have to distinguish a temporary inconvenience from a real problem, that’s a good point. Not making a mountain out of a mole hill, just getting through something that’s a temporary challenge. But you also mentioned managing one’s attitude. And really, I think that’s very important to survival situations. The most important survival tool is the one between your ears obviously. How do you manage your attitude though? Can you give any steps to doing that? It’s sort of easy to say that, but are there any tips on actually how to implement it? Michael Cosgrove: It doesn’t come naturally. You have to work at it. Just as if you wanted to run a marathon, you’ve got to get yourself in shape to do that. Well, for me it was a daily process of working on my head, keeping it straight. And many mornings, when I wake up… well I subscribe to a program of self-motivation. That’s what I like to call it. And many mornings before I get out of bed, I’m going to say, “I hope today is the first day of the rest of your life. Yesterday is but a memory; tomorrow is but a dream. Today is the first day of the rest of your life. Now you can either choose to use it or lose it. The choice is yours. Your only limitation will be your imagination. Go get ‘em Michael.” That helps to realize that it’s within my control. Jason Hartman: So, the realization of knowing what’s in your control and what’s not in your control. Definitely an important thing. It’s kind of like the prayer of Saint Francis of Assisi, “Accept the things you cannot change”. Just deal with them, in other words. Michael Cosgrove: Oh, boy. That’s a big one. Jason Hartman: Yeah. Any comments on that? Michael Cosgrove: Yes. Know what you can control, know what’s out of your control, don’t beat your head against the brick wall, don’t swim upstream, accept what you can’t control, and try to make the best of it. And that helps also, yes. Jason, it helps to know that the relationship between expectation and reality can be devastating to one’s total being without a healthy perspective. So maintain that perspective and keep your priorities straight. Know what comes first and what comes second, and don’t beat your head against the wall trying to change what you can’t change. Jason Hartman: Very good point. What else happened on the trip? You had the mutiny. I think that’s probably the scariest. Was that scarier, the problem of man? Or was nature scarier? What was the scarier problem I’m wondering. Michael Cosgrove: I could fight against my crew member if I had to. But when I was without an auto pilot hand steering the boat, storms would blow up from the southern ocean; I was in the northern [0:12:08.1] sea at the time. It was very difficult to fight the storms. Because they’re so totally controlling. How do you fight the storm? There’s no place to hide, no place to run. You’ve got to shorten your sails, adjust your sails. And sleep deprivation is one of the biggest challenges, one of the most frightening aspects of being out on the ocean alone. You can’t sleep, you can’t eat. And so you’ve got to work on your attitude constantly. And be as positive as possible. Do what you can to survive. And I thought about my wife, my grandchildren, and I had to get home. During that storm, I realized that leaving the legacy for my grandchildren by being gone for three or four years wasn’t the kind of legacy I wanted to leave. That the love of my family, the love of my grandchildren, was more important than sailing around the world. Which was kind of ego based at that point. So that’s why I gave it up in New Zealand. Because I’d rather spend birthdays with grandchildren or go to my granddaughter’s soccer game on Saturday morning than leave a legacy in that sense. Jason Hartman: Sure, sure. I’m curious; when you gave it up in New Zealand, how do you end the trip with the sailboat? Did you bring the boat back? Did the boat come back? Michael Cosgrove: There’s a company that runs a dry doc ship. They pull it into port, they fill their boat with water, you sail your boat onto the ship, they put it in a cradle, the boat empties of water, and it came back on a ship. Jason Hartman: How much does that cost? That must cost a fortune, I would assume. Michael Cosgrove: Yes, it was. It was about $12,000. Jason Hartman: But they brought your boat back and they brought it back to I guess San Diego, or New Port? Michael Cosgrove: Actually I had them deliver it to Vancouver, British Columbia. And I got on it there and went up the inland passage towards Alaska for a couple of months. Jason Hartman: Well that’s an adventure. Yeah. Michael Cosgrove: It’s a beautiful country. Michael Cosgrove: But you know, Jason, I sailed over 12,000 miles and I was never more than 3 miles from land, Straight below my boat. In all actuality many times I was over 1000 miles from land, and I never wore a life jacket when I was alone. Because if I fell off the boat, having a life jacket on would only prolong the inevitable. Jason Hartman: Yeah. Did you harness yourself to the boat though? Michael Cosgrove: Yes. I did harness myself to the boat. Jason Hartman: What would have happened had you fallen asleep, say during a storm when the autopilot wasn’t working. And say you were just, even with a storm, you couldn’t have woken up. At some point your body is just going to shut down and sleep I assume. What could have happened? Would the boat capsize? Did you just rig the sails or you dropped the sails, right? The boat would just go around in the storm. Would it turn over? Would it run into something? What’s the exact danger there? Michael Cosgrove: I was in a storm on the way to Australia and it blew 62 miles an hour. The seas were 24 feet tall. If I would have let go of the helm, it would have laid beams to the seas and we would have capsized. Jason Hartman: Oh boy. That’s just unbelievable. What about when your autopilot went out? Did you think of calling a rescue? That 16 year old girl, the story of her, I can’t remember her name now. But her parents let her leave San Diego and after about 8,000 miles I believe it was, she finally called rescue and they came to get her out of the middle of that ocean. Why didn’t you call a rescue? Did you think of it or you couldn’t do it? What happened? Michael Cosgrove: I had a satellite phone onboard with me and I called my wife and asked her to call friends that we’d had in Australia and ask her to alert the Australian coast guard and see if they could come assist me. And the word that we got back was that I was too far. I was 800 miles from Australia. Too far for them to attempt a rescue at that point because actually, the boat was still floating and I was doing okay. So maybe if the boat was sinking we could have gotten somebody out of New Caledonia or Fiji or someplace to come help. But no; I was pretty much on my own. Jason Hartman: Unbelievable. That’s just crazy. One more thing I want to ask you before you go: Any survival tools or equipment or things that you were really glad that you had and how you used them. And things that were missing. Maybe a spare autopilot that you could have replaced. That was probably missing. Jason Hartman: They both just died. How do they die by the way, what happens to them? Michael Cosgrove: Corrosion, chafing, and water. Sea water knocks out the electronics and corrosion cluttered up the mechanism on the back up self-steering gear. But before I left, I bought 300 MREs (meals ready to eat). And they’re very convenient. I just bought the entrées. And my daughter, my number two daughter Keri who had just spent 4 years in the army said dad, you bought MREs? Do you know what we used to call those? And I said no Keri, what do you call them? She said meals rejected by Ethiopians. Jason Hartman: That’s pretty good. Michael Cosgrove: But I would blast the helm down, run below, grab an MRE, grab a small bag on instant rice, come back, grab the helm, put one of the MREs inside my foul weather jacket in my arm pit, the rice in the other armpit and I’d leave them there for about 30 minutes hoping that they would get warmed up. I’d pull out the MRE, rip the top off with my teeth, squirt in some, get the rice, squirt in some rice and chew. That was one piece of equipment or provision that was really helpful because it was very difficult to prepare anything. So I haven’t eaten an MRE since and I don’t think I ever will. Jason Hartman: Okay, so MREs were handy though. Those came in handy for sure. Anything else? Other equipment or survival tools? Michael Cosgrove: Yes. Epirb. An emergency locator, that if it had gotten wet it would send out a GPS emergency beacon signal to alert coast guard and rescue people around the world. That’s called an Epirb. Jason Hartman: But the Australian coast guard wouldn’t rescue you because you were too far, so would that have even mattered? Michael Cosgrove: If the boat would have capsized, they would have launched a rescue mission. But without what they thought would be classified as immediate danger, they wouldn’t come out. But if Epirb would have sounded, they would. The safety harness was invaluable; being able to clamp in and stay on the boat. The dingy and the life raft were very helpful. I wouldn’t go out there without a life raft that was provisioned. Fortunately I never had to launch it, but those were two items that were very helpful. Jason Hartman: Well hey, tell people where they can get the book and if you have a website of your own, please give that out. Michael Cosgrove: Yeah. Sure, thanks. My website is MichaelCosgrove.com and the book’s available on Amazon or Barnes & Noble. I really like independent book stores, so if you’d like to buy a hard copy they’re available in the book stores. And thank you very much Jason. Jason Hartman: Yeah well thanks for coming on the show. Michael Cosgrove, author of Imperfect Passage. Narrator: Thank you for joining us today for the Holistic Survival Show, protecting the people, places and profits you care about in uncertain times. Be sure to listen to our Creating Wealth Show, which focuses on exploiting the financial and wealth creation opportunities in today’s economy. Learn more at www.JasonHartman.com or search “Jason Hartman” on iTunes.